He has completed his Ph.D (Business Administration) from University of Lucknow with the topic “An investigation into drivers of Competitive Advantage-a case of Indian Pharmaceutical Industry in retail drugs” along with UGC-NET in management. 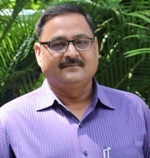 He has spent around 7 years in Pharmaceuticals and flexible packaging in marketing, general management and operations domain. He has been teaching MBA students for more than 14 years. The last designation which he held was Professor and Head-MBA, Institute of Business Management, GLA University, Mathura. He has undergone eight courses (at IIML, IIMA, IIMB, IIMC, IIMI, MDI & IIFT) conducted by strategic management forum of India and has received Management Teachers programme certificate. He has completed six months course on small scale industrial enterprise management from IIT Kanpur and is a certified auditor from Joint Accreditation System of Australia and New Zealand (JAS-ANZ). He has to his credit two edited books and 12 Publications. Dynamic capabilities; strategies for sustainability; strategic change; Business models and competitive advantage; Economics of strategy; Organizational adaptation and agility. Strategic change; Competitiveness of SMEs; Sustainability practices for competitive advantage; ISO and quality standards; Business models for new business ventures. 2) Singh, A.K. & Burhan, M (2015). Factors influencing organizational change and health - Evidences from the Indian pharmaceutical sector. Journal of Business Chemistry, Vol. 12, No. 3, pp.69–84. 3) Singh, A.K. (2014). Integrating robustness and resilience in change and competitive advantage framework: insights from Indian pharmaceutical industry. Int. J. Strategic Change Management, Vol. 5, No. 4, pp.348–376. 4) Sharma, J.K. & Singh, A.K, (2012). Absorptive Capability and Competitive Advantage: Some insights from Indian Pharmaceutical Industry. IJMBR- International Journal of Management and Business Research Vol. 2, No. 2. 5) Sharma, J.K. & Singh, A.K.(2012). Change and competitive advantage: an investigative study of Indian Pharmaceutical Industry. The IUP Journal of Business Strategy Vol. IX No. 3 September 2012, ISSN No: 0972-9259.